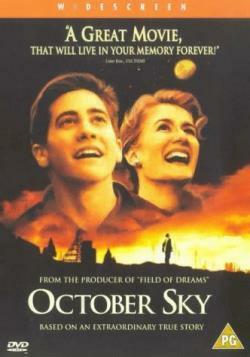 National Science Foundation Director France Córdova explains why she likes October Sky. The 1999 movie is still relevant. As the director of the National Science Foundation, I am always looking for innovative ways and outlets to spread the message about the importance of science. Wednesday, Dec. 2, was no exception. In collaboration with Future Tense, I hosted a screening of October Sky, the 1999 film about a teenager (Jake Gyllenhaal) eager to reach for the stars as a rocketeer after becoming inspired by the launch of Sputnik 1. Without a doubt the onset of the Space Age triggered a new era of scientific innovation in America. The film is based on the life of Homer Hickam, who went on to become a NASA aerospace engineer and author. This movie is a great example of how to overcome life’s obstacles and the lack of knowledge—and how education gives us the opportunity to connect with something bigger than ourselves. It also illustrates how the process of innovation takes place. Too often, we can be lulled into the idea that innovation is the easy product of genius or that it happens overnight. In reality (and in this movie), it’s actually the product of laborious trial and error. Those challenges are the best lessons that can be learned in the lab or in the field. NSF has been the backbone of America’s science and engineering research enterprise for more than 60 years. We have supported thousands of scientists from the very early stages of their careers. Many of them, like Gyllenhaal’s character in the movie, had a moment of inspiration in their lives. We like to say that NSF is “where discoveries begin.” Many of the discoveries and technological advances we supported throughout our history have been truly revolutionary. NSF’s investments in basic research enhance our nation’s economy and security by fostering innovation. Often, that innovation requires a moment of inspiration—followed by a lot of hard work, and sometimes a few explosions. A version of this blog post first appeared on the “Field Notes From the NSF Director” Tumblr. Future Tense, My Favorite Movie: Dr. France Córdova on October Sky from ASU Now on Vimeo. Future Tense’s “My Favorite Movie” night series invites leaders in science and technology to host a screening of a film with sci/tech themes in Washington, D.C., and then lead a short discussion about the movie. To find out about our next My Favorite Movie night, sign up for the Future Tense newsletter. Got an idea for a My Favorite Movie host? Tweet it to @FutureTenseNow.